School’s out and Fuzz is playing with the kids next door. They’ve formed a little gang that goes back and forth from house to house. Right now, they’re at the other house. It’s not so fun here because the upstairs is still under construction, much like this cake Four Day Coconut Cake. I am on “Day Three”. Here’s the recipe as I made it. Coconut cake that improves over time. 1 yellow cake (box cake or scratch) . I used a "1-2-3-4 Cake" scratch cake from the Swans Down Flour people. Day One: Mix together the sour cream, sugar and coconut. Cover and let sit in refrigerator over night. Day Two: Bake a very moist yellow cake using your favorite scratch recipe or a good brand of yellow cake mix. Bake it in two round 9 inch pans, then let cool completely. Cut the cake layers horizontally to make 4 layers. Spoon coconut mixture over each layer and stack. Place stacked cake in some sort of cake container and refrigerte for 3 or even 4 days. The coconut mixture will become firmer as it sits. Day Four: Whip up a cup of heavy cream and sweeten with a couple of tablespoons of powdered sugar and maybe some vanilla......or buy an 8 ounce tub of whipped topping. Spread over top of cake or all over cake. Garnish cake with something pretty like berries or caramel ice cream topping, then cut into squares and serve. I am not going to post a picture of this cake until tomorrow. Will you post some before and after pictures of the house renovation? I love seeing home improvements and need some inspiring ideas as we are moving this summer and I would love hardwoods. 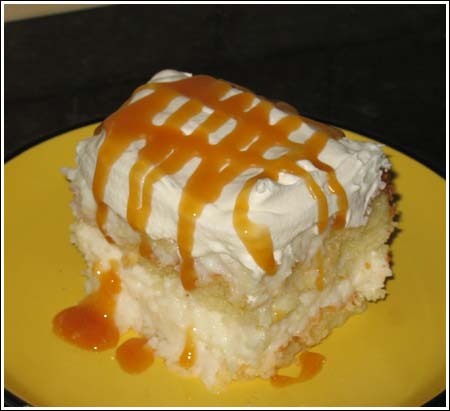 The “theory” behind this cake reminds me of a coconut cake my mom makes, except the sauce for it is totally different from this one. It is absolutely delicious, though. Can’t wait to see this one.